The lead instructor, Walter Decorek, is certified by the Motorcycle Safety Foundation and started teaching in 1986. With more than 25 years of experience we offer quality training in a relaxed setting with no rush and no hurry. The courses are evenly paced to provide every student an equal chance to learn & grasp each exercise before advancing to the next level. At Advance Cycle Training Center we are dedicated to teaching students to become safe, knowledgeable, skilled riders who will derive years of enjoyment from the sport. 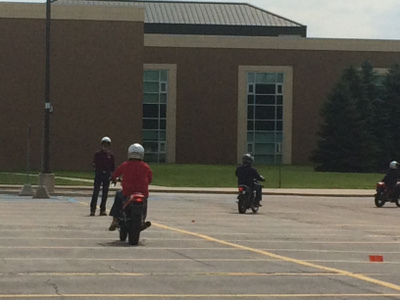 We take the time to make sure each student gets the attention needed to become a good rider. The Motorcycle Safety Foundation has certified us and we are inspected and recommended by the State of Michigan to train riders on the fundamentals, as well as advanced skills, required to enjoy the sport of motorcycle riding for years to come. For questions or comments you can contact our Program Director at: advancecyclellc@gmail.com. Develop your basic riding skills as you learn proper turning, shifting and braking. This course is for those that have their own bike and are ready to step up to the next level of riding experience. Teaches the rider much more advanced street skills and the opportunity to find what they are capable of on their own bike. This one day course is designed for the experienced or the unlicensed rider who needs to get legal or needs a refresher course! Many licensed riders use this course as a spring tune up for their skills after a long winter! We’ll cover some braking, counter steering, turning, speed judgment, and other techniques needed for the experienced rider to operate their motorcycle skillfully and safely!